-1- "What goes *on* in the library at night?!" I worked the evening reference shift yesterday. We all have to volunteer for a few "undesirable" shifts each semester, and this was one of mine. So, at 5 pm, I station myself at the reference shift and try to look alive. There was a decidedly odd looking character sitting near the desk with a gigantic suitcase sitting next to him (?!) and I did my best not to make eye contact. If he asked me something, obviously I would help him, but I don't go looking for trouble at the reference desk. A student came up with a fairly lengthy question, and I helped her happily, feeling very librarian-like. She left satiated, and I glanced behind me. Odd Character was still there, but he was being quiet. Suddenly, a man approaches the reference desk. He seemed intent on selecting one of the free pencils we leave out there, but I glanced up and smiled at him to see if he needed anything else. He leans over in a conspiratorial fashion. Whispery Man: "DO I OFFEND YOU IN SOME WAY?!" You know how those moments go. In a split second, my face went from "How can I help you, my friend?!" to "Dude, you're WEIRD! PLEASE STEP AWAY FROM MY PERSONAL CIRCLE OF SAFETY!" So, my face said that to him although my voice said in a startled fashion, "of course not!" and he gave me a frightened look and scampered off. He loitered near the Circulation Desk for a long time making the students there very uneasy, before finally tiptoeing out the front door. When the sun goes down, this is what happens in the library. When I got home, I found a happy package from Image Books with a title for me to review here on this blog. -3- "Mommy, Anne's stomach hurts!!" "Anne's having that problem again." Oh sigh. To put it delicately, this child has digestive issues more often than anybody on the *planet* it seems. We're constantly plying her with fruit and juices that, *ah hem*, work toward the end we're seeking, but it's a tough sell, let me tell you. We just want her to be comfortable, and do what we can for her, but it causes no end of anxiety. For her and for us. This pall hangs over the household until she produces and we all breath a collective sigh of relief. Mike calls this phenomenon: "Poo Tension." Yes, I just said the word "poo." I do that sometimes on this blog. When you're a parent of small children you gotta do what you gotta do. -4- "I need sources for a paper." "Ok, what's your topic?" "I don't know." In other librarian news, things have quieted down for me in terms of instruction, but my efforts continue to bear fruit :0 in the form of lovely (and sometimes clueless) students who wander into my office. Truly, though, I do love helping them. Even when clueless, they're generally a joy, and they appreciate my help, and so I send them happy, positive vibes. This one was a tough sell that he had to narrows his topic down a bit from, you know, ANCIENT ROME, but he was very sweet. We found some books on military tactics and developments within Ancient Rome in the Catalog, and I showed him how to find them in the stacks via the Library of Congress Call Number System. And then how to check them out. He's a freshman, he's excused. Ok, back to Catholic "stuff." I am starting a 54 day rosary novena today for a special intention. If you start today, dear reader, you will finish up on New Years Eve, vigil of the Feast of Mary, Mother of God. Sweet, right?! If you've been meaning to make such a novena, join us! You pray a rosary each day for your intention for 27 days. Then for the subsequent 27 days, you pray in thanksgiving for your intention. If you have a biggie on your heart, this novena is just splendid. I prayed one back when I was pregnant with Anne that I still think back on. Because Henry did indeed end up in Catholic school (read the linked post to see what the heck I'm talking about :)). -6- Advent fever is really picking up!! Be prepared to be annoyed by me this Advent, because I'm so excited I can hardly contain myself. Hence, ready yourself for daily Advent posts and linkups. Heck, it's not even Advent yet and I'm already posting on it. I was thinking that I haven't written a Catholic Nook post in about a month, and let's just say an Advent-themed one is percolating for next week. Stay tuned! -7- Vocations Spotlight Mondays, coming right up! I mentioned this a few weeks ago, but I'm going to have a new short series on this blog highlighting religious vocations. My first victim :) is a young priest, and he graciously responded to all of my questions , and so part 1 of his interview will be posted on Monday! Please do check back to read about his faith story and discernment process. The following week he will discuss his ministry and daily life as a priest. Come check it out! 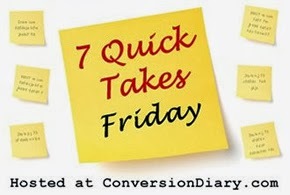 Thank you to Jenn for hosting 7 Quick Takes, and head over, quick like a bunny, for more posts! Oh the poo issues. Since I used to teach the little guys I feel your pain. I have the opposite end problem. My oldest took after me and almost always vomits when sick even if its just a cold. Although last nights performance Im sure was viral. My turn soon? My husband thinks he has GERD which would explain him not desiring to eat much. oh ugh. It's always something!